A beautiful pool became even more enjoyable with the addition of this multi-purpose pool cabana. The shady, open porch area of the cabana has, on one side, a conversation area with comfortable furniture. The other side has plenty of counter space for prepping, cooking, serving and dining. The flooring is a stamped concrete overlay in a flagstone pattern, while the structure and kitchen are finished in stucco and stacked stone. The rear portion of the structure has a full bathroom with walk-in shower, as well as storage with a stacking washer and dryer. Plenty of counter space and great accent lighting. The stamped concrete overlay is a flagstone pattern. The ceiling is beaded tongue & groove pine with a heartwood stain. 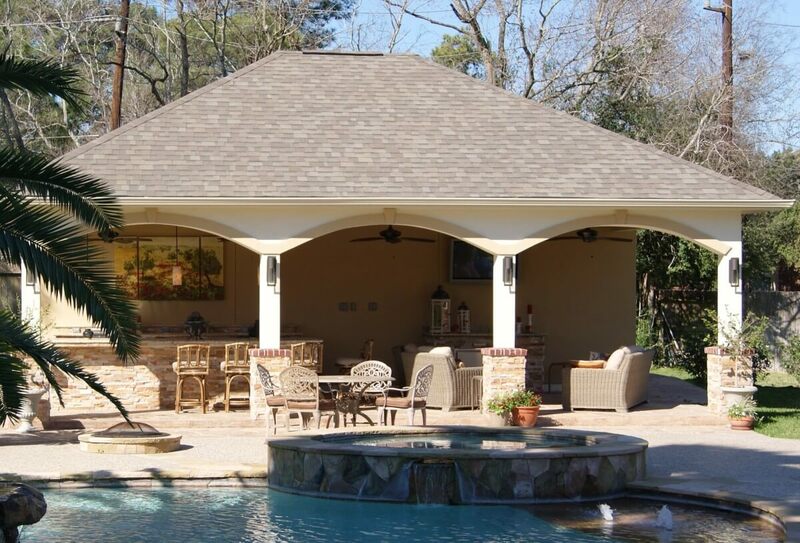 Ceiling fans, recessed can lighting, carriage lights, outlets, flush-mounted speakers and a television make this patio cover great for entertaining. The side door leads to a bathroom and utility room with additional storage space.